In order to truly understand Deinococcus radiodurans, you have to start with the basics. This prokaryotic bacterium is red pigmented, nonmotile, and gram positive. The color of the cells reflects the red carotenoid pigment the bacteria produces. D. radiodurans is approximately 1.5 to 3.5µm in diameter and produces smooth, convex colonies that range in color from red to pink. 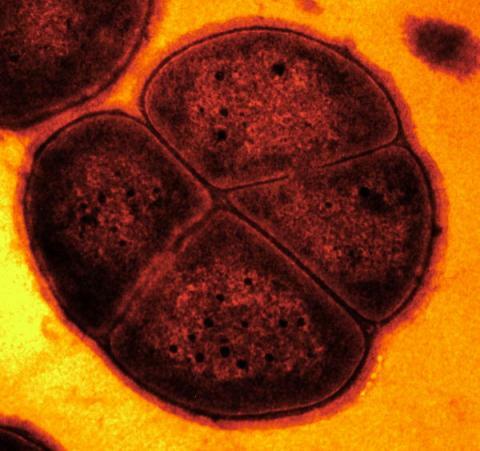 What Makes Deinococcus radiodurans a Happy Bacteria? The generation time is measured at approximately 80 minutes under optimal growing conditions. The best growth is seen at between 25 to 35°C however growth ceases below 4°C and above 45°C. This chemoorganotroph thrives in an aerobic environment with the ability to utilize a vast array sugars, amino and organic acids as a carbon source for catabolism. It basically eats like a 16 year old high school football player, anything and everything it can! D. radiodurans undergoes binary fission and reproduces in two planes arranging the cells in tetrads as seen in the picture at the top of the page. Genetic engineering of the organism first appeared to be a challenge because there was no bacteriophage specific to infect it and the cells were not capable of conjugation. However, the cells of D. radiodurans are fully competent. This ability of transformation means that it can uptake free DNA very efficiently. D. radiodurans is the only species in its genus that has this capability, making it the most widely studied organism of its genus. Although, D. radiodurans is gram positive, it has a particularly unique cell wall. The wall contains multiple layers and an outer membrane, normally only found in gram negative bacteria. It also lacks teichoic acid, which is characteristic of most gram positive bacteria. Even the peptidoglycan itself is unique. The peptidoglycan of most gram positive bacteria contains diaminopimelic acid in the muramic acid cross bridges, but D. radiodurans' contains ornithine instead. Some strains also possess the ability to produce a crystalline S layer outside of their cell wall. Now that you know HOW it lives... find out WHERE it lives!